The Garmin ZUMO 390LM GPS - Designed By Bikers For Bikers! Not all GPS devices are created equal. The Garmin Zumo 390LM is designed to deal with the conditions that we as motorcyclists, face every day. This GPS features an easy grip, durable hard rubber case that is both UV-resistant as well as fuel spray resistant. Add that to the fact that you can submerge this unit into as much as 1 meter deep of water for up to 30 minutes and have it still function is amazing. The touch screen is glove friendly, and glare free. The back of the unit has connections for an external headset and a micro SD card slot and a mini USB cable, all which are protected by rubber covers. The Garmin 390LM comes preloaded with maps of North America. Need more maps? Just connect your Garmin to your computer to download updates, or upload routes from Garmin's BaseCamp trip-planning software. Like the LM suggests, this unit comes with Free lifetime map updates! But that's not even the exciting part...The Garmin 390LM comes with a feature they are calling Curvy Roads. 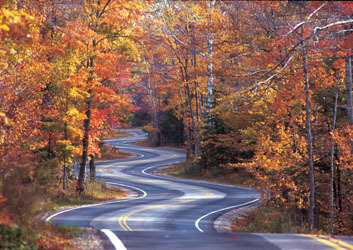 This allows you to select, from the Calculation Mode, a curvy road experience, which shows you one or more routes that maximize the number of curves along the way, based on a inner-routing algorithm. This option is available along with the standard Shortest Distance, Faster Time and Off Road, that you may have seen on similar GPS units. This unit features Bluetooth wireless technology. Connect your Garmin with your mobile phone and a Bluetooth-headset or helmet to call points of interest through the interface, or receive and make calls without having to take off your gloves or helmet. Perfect for those last minute plans or unplanned roadside stops. You can also transmit voice prompts to your compatible headset, keeping your focus on the road and not on the display screen, while riding. As if that wasn't enough, The Garmin Zumo 390LM also features the ability to use an optional Tire Pressure Monitor Sensor (compatible with metal valve stems only), allowing to notice any changes in your tire pressure while you ride. The sensors are sold separately from the unit and one sensor is needed for each tire (up to 4 tires), to make the system work, but if pressure in either tire falls below the threshold, a warning message is displayed on the screen, allowing you to know right away something is wrong. As a safety feature, this really can't be beat. If you like to get out and explore the unknown roads and find new routes, you need this feature-rich, user-friendly unit. The Garmin Zumo 390LM, allows you to appreciate the ride in safety, as you explore. Enjoy the ride! Ride safe! » Welcome to the NEW Spoiled Biker! » Experience the Change of Seasons With "The Rattler"
» The Garmin ZUMO 390LM GPS - Designed By Bikers For Bikers! » Appalachian Angels With "Cruizin' For Kidz"